The endangered mountain gorilla resides in central Africa which is often a politically unstable region. 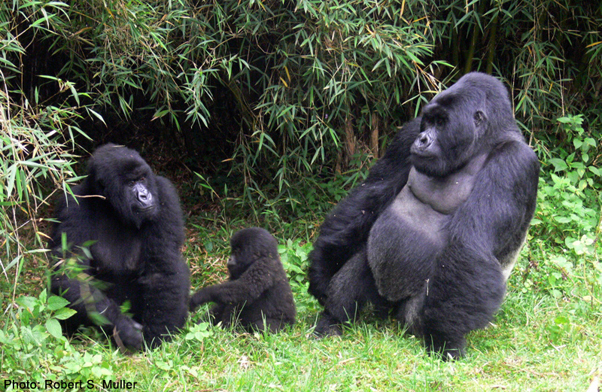 Mountain gorillas don't have much interest in politics, but for nations like the Democratic Republic of the Congo or Rwanda, instability can impact the country's ability to support the conservation and protection of these apes. Currently, there are approximately 790 mountain gorillas with over half of them living in the Virunga National Park in DR Congo. 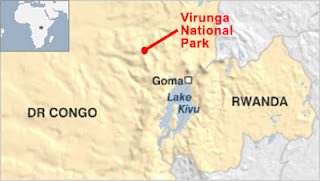 Unfortunately, rebel activity in May forced the evacuation of the park rangers and without the rangers presence the location of the six known families of mountain gorillas that move, eat, and sleep within the park becomes a question mark. And it leaves the gorillas exposed to poachers who will kill the gorillas for black market trophies of head, hands, or feet. While the rebel unrest has been ongoing since April, recently the rebel forces and the opposing government forces both agreed to allow the rangers into the area to search for the gorilla families. With some unexpected shelling taking place, it was touch-and-go, but eventually the rangers were allowed today to begin conducting their search. No results are known just yet. "We have had to delay 24 hours because of the shelling that took place this morning," park director Emmanuel de Merode told the Associated Press. "There is very heavy fighting around the park headquarters." As powerful has they are, mountain gorillas are also susceptible to disease and so monitoring their health is of prime importance to the park rangers. Their weakness to disease would be a less critical issue if their numbers were more towards what nature intended. However, with human encroachment on their habitat, demands for oil exploration within the park, and the on-again, off-again military conflicts, the birth or death of any gorilla becomes vastly more important given their current numbers. "We are delighted and relieved that all sides in the conflict have recognised the need to protect [DR] Congo's only mountain gorillas," said de Merode. "After locating the gorilla families, the park's gorilla monitoring teams will individually identify each member of the family. Their health status will also be assessed as mountain gorillas are particularly vulnerable to disease." Over two years ago, I ran a post about the mountain gorillas in Virunga National Park. At the time, the Park had just issued an iPhone app, called iGorilla, that allowed the user to follow the ranger's efforts in keeping tabs on the various gorilla families. I still have the app on my phone today and check up every once in a while for the latest reports on their health and whereabouts. The app is still available today and part of the proceeds goes to the Park's gorilla conservation program. Check it out.